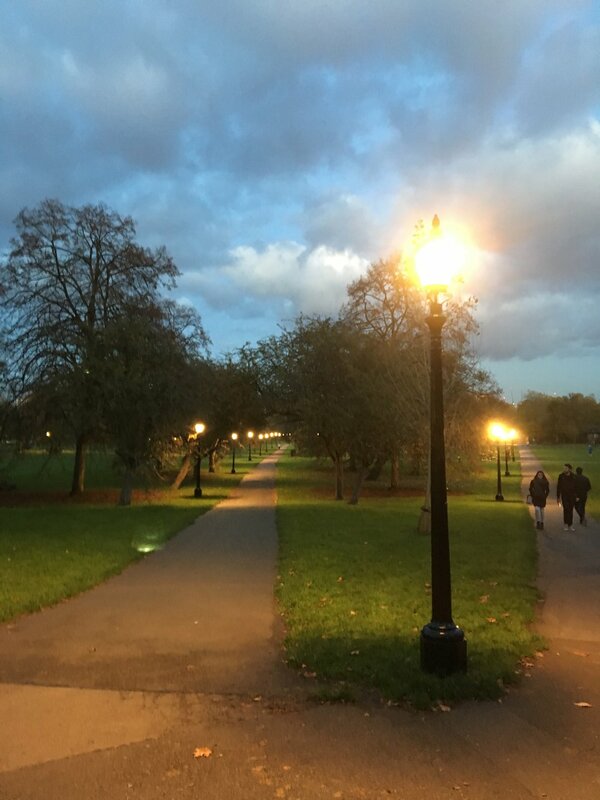 Last night we walked up Primrose Hill in the twilight. The sun was setting across the other side and the fiery light burned through the trees. People gathered at the top, their silhouettes like statues against the mauve skyline and we all stood together watching the City lights grow brighter as the sky grew darker. Someone played Marvin Gaye on a portable speaker and the kids danced and jumped along the raised step. We stuffed our hands into our pockets and put our hoods on, the first time we felt the cold this winter, and waited. We didn’t know where they would come from but then there would be a 'bang bang bang' and a 'screaming whistle' and we would turn and catch a glimpse of the colourful, falling stars that had been set off in a neighbouring village, and then nothing. We waited some more and felt the history of the place beneath our feet. There was a natural hush about the hill, a magnetism that pressed against you. For it was a place where wolves once roamed and druids gathered and where duels were won or lost. Centuries ago, it almost became a cemetery, and in HG Wells' The War of the Worlds it was one: the martians came to the hill to conquer and then to die. We moved our feet and saw that there was an etching beneath them: 'I have conversed with the spiritual Sun. I saw him on Primrose Hill’. Someone shouted,‘Look, there!’ And then: ’Bang! Bang! Bang!’ There was a spray of green and red and yellow falling and then nothing.